Created by Chelsea Fuss (and found on Once Wed) I immediately fell in love with this simple table scape from the moment I first saw it. 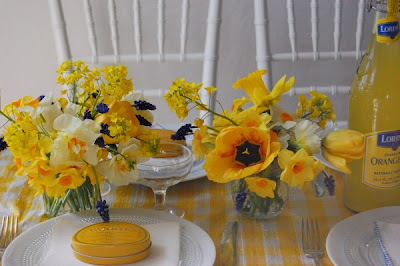 With the weather here flip flopping between the beautiful 70's one day and snow the next, I would love to kick off the warm weather (whenever it decides to come back) with a simple dinner party decorated like this. 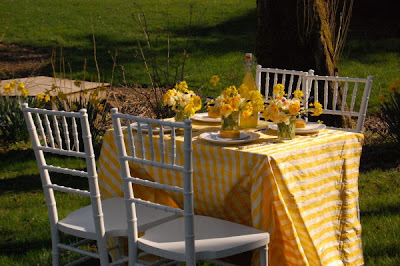 Doesn't it remind you of the board I created a few days ago (with that awesome yellow and white party dress)? Not only is the table beautiful, I absolutely love how Chelsea tied in family style dining by including bottles of lemonade and laid back wild flower arrangements. Nothing stuffy about this party :) Oh, and did I mention it is all very easy to DIY and relatively inexpensive? For more info, read here. Here's to hoping for warm weather! Enjoy!